Pahrump, Tuesday 23rd of September 2014. Construction crews cut the fiber optic cable for AT&T, which knocked out all cell phones but T-Mobile and about half of the land lines and internet. This caused limited contact within and outside of the valley. This accident happened about 8-8:30am and phones were restored at about 6pm that same day. 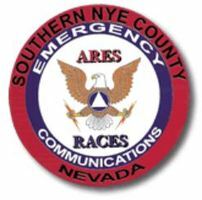 Vance Payne, the Emergency Manager for Nye County, who is also a ham, called upon the Southern Nye County Amateur Radio Emergency Services, Inc for help with communications.